With loads of apps and other productivity software promising to handle all of your various Mac needs, it’s tough to tell which ones actually have the goods to back up all that talk. So, when you see an app with credentials like Top Paid App, 2015 App of the Year, an Editors’ Choice honor and a stellar 4.6 out of 5 stars from over 1,100 reviews in the Mac App Store, you should probably pay attention. That app is PDF Expert for Mac — and right now, it’s on sale for more than half off at $24.99 from TNW Deals. Love ‘em or hate ‘em, PDFs are still the preferred format of choice for bouncing documents back and forth across the web. Since no pre-installed Mac software is up to that task, PDF Expert allows you to do all the editing necessary on a PDF document, whether you’ve created one yourself or received one from others. If you just need to handle a simple duty like adding or changing text, images or links, PDF Expert has you covered. And when your PDFing requires more complex fixes like merging forms or even shifting fields around, you’ll again find an easy time making those moves with PDF Expert. Beyond making PDF editing as simple as basic word processing, PDF Expert also simplifies how you distribute your forms. Once you’re finished with a PDF, you can forward it via your iPhone, iPad, or Mac, or share it with clients, co-workers, or anyone else efficiently. Features even allow you to password-protect your document, adding a vital layer of security on important forms with sensitive information. 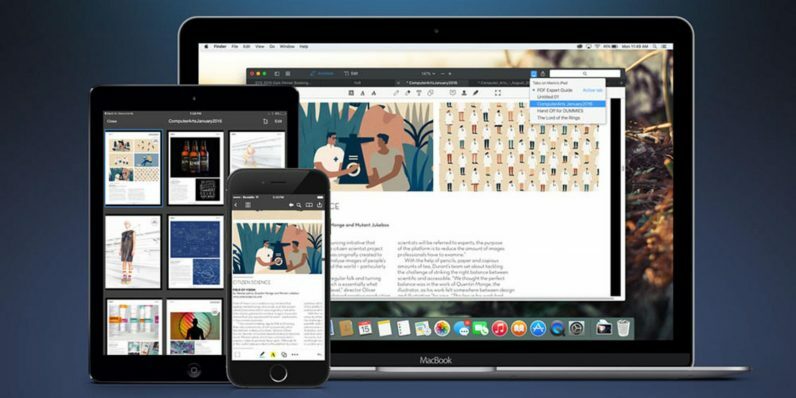 Even if you’re not convinced by Apple’s word that PDF Expert is top grade software, it’s cheap enough that you can just try it and find out for yourself. It’s only $24.99 while this offer lasts.